The Embodiment of the Marauder Set Dungeon is located in Act III, the Fields of Slaughter. Teleport to The Bridge of Korsikk waypoint and head upwards through this giant open area. Head to the center of the map, where the Trebuchet is located in the campaign (the device hanging above the massive fiery chasm). In adventure mode, it should be replaced by the portal for the set dungeon if you have the Marauder 6-piece bonus active. The Embodiment of the Marauder Set Dungeon's two unique Primary Objectives are to: 1) Kill 140 enemies with 3 or more Sentries active; and 2) Do not allow any enemies into melee range. 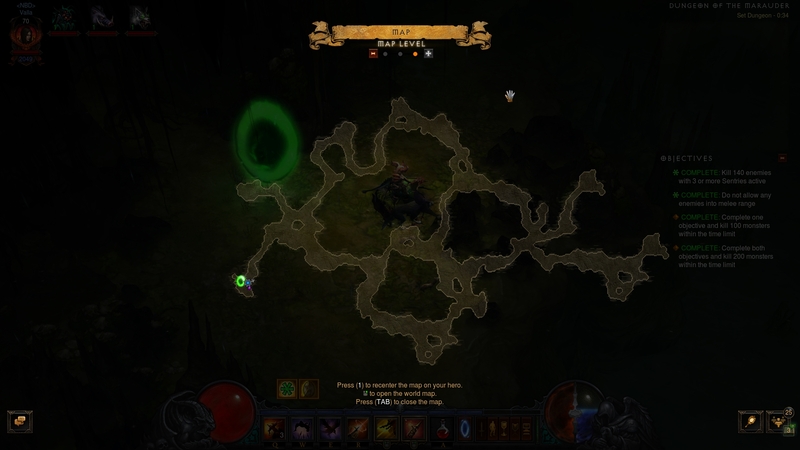 The Embodiment of the Marauder Set Dungeon is an Act 5 Cavern tileset of three interconnected rings, one larger and two smaller. A suggested path would be to take an immediate right after the starting area and clear the two smaller rings on the right, leaving the larger left cavern ring for last. Spine Lashers, Quill Fiends and Golgors — swarms of trash that populate the majority of this dungeon. Harmless, but will close in on you relatively quick and fail the melee range Objective if you are not careful. Rockworms — the single biggest threat to the melee range objective, these burrowing monsters will tunnel right beneath your feet. Malevolent Marauders — the unique enemies of the map. They resemble Act 3's Golgor trash, but also have a Desecrator and Frozen affixes. Like their trash brethren, these elites should pose no threat if you play out the build correctly. The Marauder Set Dungeon is rather easy to complete, with no finicky requirements and failure conditions. We do recommend that you play the Rocket-based variation of our Marauder Cluster Arrow build on Icy Veins, since the Grenade-based GR variant will come dangerously close to failing the melee Objective. If you are new to the Marauder playstyle, simply know that it revolves around placing Sentry turrets continuously as you advance through a level. Make a point to place a Sentry as soon as it comes off cooldown, since you will be moving fast and can easily and understandably lose track of their current active number. The default skill will allow you 2 charges, so you will need at least the relevant Custom Engineering passive, but ideally the dedicated Bombardier's Rucksack quiver as well. As mentioned before, the Rockworms are the only real threat in this dungeon, aside from Vaulting carelessly into unseen trash and failing the 2nd Objective yourself. Pay attention to the minimap for the Rockworm's appearance, and make use of their momentary delay as they prepare to spring up from beneath you to Vault away into safety. 02 Mar. 2018: Added guide.